Our gorgeous Ragdoll kittens are available to go to their new homes from 12 weeks of age. They will be vet checked, desexed, vaccinated, microchipped, litter trained, wormed and registered with GCCFSA. Certified Pedigree papers will be mailed to you from GCCFSA. Our Ragdoll kittens also leave with a free 6 week pet insurance policy with Petplan. 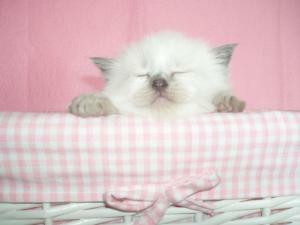 Our Ragdoll kittens will ONLY be sold to kind, loving indoor homes. We feed our Ragdoll kittens Royal Canin Mother & Baby cat dry food plus a variety of human grade meats including chicken, beef, lamb, turkey, kangaroo and also the following wet foods - Royal Canin baby cat Instinctive and Royal Canin kitten Instinctive. As the kittens get a bit older we also introduce them to Royal Canin kitten. 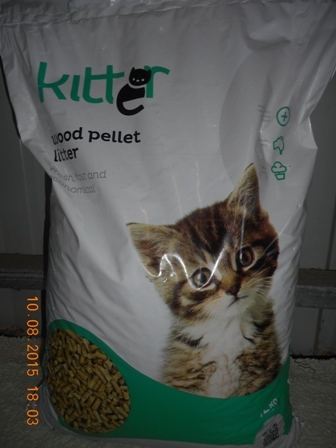 We use and recommend Kitter wood pellet litter in a two piece sieve tray. Kitter gives your home the benefit of that fresh pine scent, absorbs more liquid faster than other litters and is economical to use. 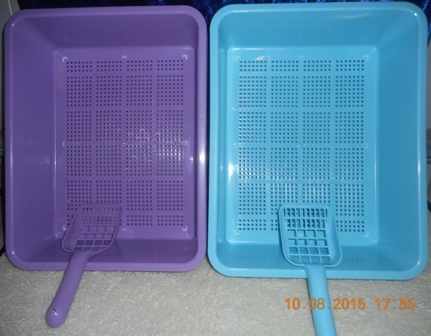 We have 15kg bags of Kitter wood pellet litter plus the kitter sieve trays in purple or blue available for purchase. Our Ragdoll cats have been DNA tested for HCM and PKD. All new Ragdoll cats brought in are tested for FIV/FeLV prior to entering our closed cattery. We currently breed Ragdoll kittens in all colours being seal, blue, chocolate, lilac, red and cream and in all patterns being point, mitted, bicolour, tabby, tortie and tortie tabby. We are a closed cattery and we do not provide stud services to visiting queens or have visiting cats. We also ask that if you have visited another cattery, please do not arrange to visit our cattery on the same day. This is to ensure the health and well being of our Ragdoll cats and our Ragdoll kittens. Notice: A non-refundable deposit of AUD $300 will secure a pet kitten of your choice until the kitten is old enough to join your family. Show quality kittens have the potential to win at cat shows although no guarantee can be given on results in the show ring. A non-refundable deposit of AUD $500 is required. Breeding kittens will only be sold to registered breeders. A non-refundable deposit of AUD $500 is required. Prices vary depending on colour and bloodlines. Interstate and International enquiries are welcome. Kittens required for overseas are quoted on an individual basis. * Freight not included. Fees and charges are subject to change without notice. No kitten is considered reserved until a deposit has been received. If no deposit has been received, we take no responsibility for someone else securing the kitten you desired before you. Roxyrags reserves the right to refuse or cancel a sale at any time without the need to stipulate a reason. If a deposit has already been paid and Roxyrags cancels the sale the deposit will be refunded. Roxyrags reserves the right to have first choice of all kittens. Roxyrags reserves the right to keep a kitten longer if we feel one of our babies needs extra time with us. No kitten will be allowed to leave our home unless in a suitable cat carrier - this is to ensure their safe travel and prevent escape. Kittens not collected on going home day will incur boarding fee charges. No one may visit our home if they have been to another breeding cattery, animal shelter or pet shop the same day - NO EXCEPTIONS - this is to ensure the health and well being of our Ragdoll cats and our Ragdoll kittens. We are currently accepting deposits for the above upcoming and planned litters. By paying a deposit we know you are serious about purchasing a kitten from us.